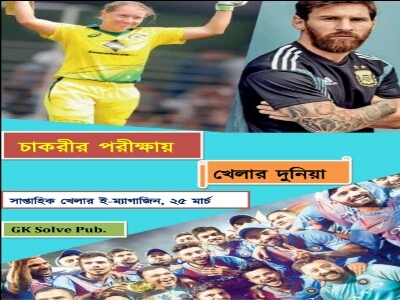 Bengali Sports Weekly Magazine full pdf provided here. Sports is the most important current affairs topic for any kind of Exam. So if you good result in job exam you read sports news because one or two question always comes from the Sports. Most of the Bengal job seeker search on Internet Sports current affairs question & Answer. But they can not find the proper book. Don't worry, we solve this problem. GK Solve publishes weekly Bengali Sports magazine ebook. Today GK Solve share Bengali Sports Magazine 25th March Full PDF Download Link. Details of this sports magazine and download link are given below. You can download easily this sports magazine pdf book from our website just one click and free of cost. So Readers, don't late, download this sports magazine and read carefully.